The Russian Navy is also slated to receive eight combatant craft and 23 auxiliary vessels in the coming months. The Russian Navy is expected to receive 12 new warships, eight combatant craft, and 23 auxiliary vessels in 2016, Russia’s Minister of Defense Sergei Shoigu told reporters on August 1, TASS news agency reports. “The Navy is planned to receive this year 12 warships, eight combatant craft and 23 auxiliary fleet vessels. Of these, six warships and four vessels are being built at enterprises of the United Shipbuilding Corporation (USC),” Shoigu said. In addition, the Russian Navy will receive the lead ship of the new Admiral Gorshkov-class (Project 22350) guided missile frigate in November, the minister said. In total, the Russian Navy plans to induct 16 vessels of the class in the coming years. As some analysts have noted, however, a further delay is likely given that the ship’s air defense systems—the Polimut Redut air defense missile system (Russia’s answer to the U.S. Navy’s Aegis combat system)—has been suffering from some defects. As I reported previously (See: “How the Ukraine Crisis Interrupts Putin’s Naval Dreams”), Russia no longer has access to Ukraine-made gas turbine engines and is in the process of trying to indigenously produce a propulsion system for its large surface warships. Russia may still have enough engines in stock for the first two Admiral Gorshkov-class and three Grigorovich-class vessels. However, it is unclear how quickly Russia’s shipbuilding industry can design a gas turbine of its own. Shoigu also said that the navy will commission the first out of two planned Ivan Gren-class (Project 11711) landing ships and a new Aleksandrit-class (Project 12700) minesweeper in 2016. The navy will also receive Project 636.3 Kilo-class (aka Vashavyanka-class) diesel-electric submarines this year bringing up the total number of Project 636.3 subs to six. Six more Kilo-class boats will be built for Russia’s Pacific Fleet. 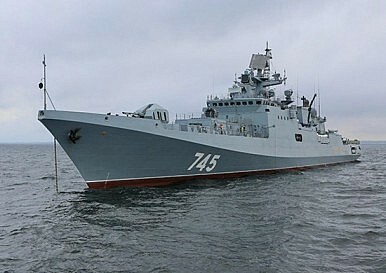 Russia’s defense minister did not specify the other ships that are expected to be added to the Russian Navy in 2016, only vaguely noting that Steregushchy-class corvettes (Project 20380) corvettes are currently under construction in addition to “rescue vessels and other armament support ships.” Shoigu did point out that in 2015 the naval rearmament plan was not fulfilled, with USC alone failing to deliver seven vessels on time. Russia’s surface fleet modernization will face further delays without Ukrainian military hardware.